Colour Me Pretty Cats Eye Gel Polish requires a magnet to achieve the Cats Eye Effect. This flower magnet will help you to create even more amazing designs when using our Cats Eye Gel Polish. 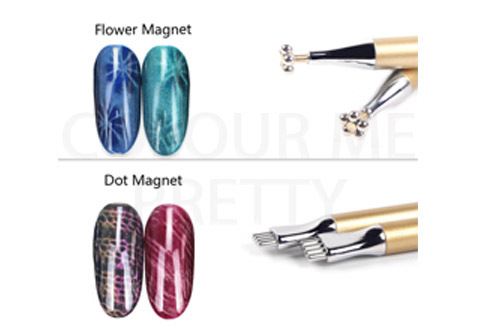 One end of the magnet will give you very cool flower patterns whilst the other end contains 4 dots that can be applied to create hundreds of different looks. Instructions for Achieving Cats Eye Effect. 2. Apply a thin coat of Cats Eye Gel Polish but DO NOT cure. 3. Hold the magnet 1mm from the Gel Polish. Do not touch the gel polish. Cats Eye Look to run, will depend on what angle you hold the magnet. Hold the magnet in place for 10 to 30 seconds. The longer you hold it the more intense the cats eye look will be. 4. Cure when you are happy with your effect. 5. If you need a second coat then repeat from Step 2. Ensure you do not let product come into contact with skin.